"If you want more luck, take more chances"
It's the hottest day of the year at Lucky Land Amusement Park in Lancaster County, PA. Abigail, Sarah, and Moira - three Amish girls from a nearby community - arrive at the park for their very first day of Rumspringa, the year in an Amish teenager's life when they are given the opportunity to explore the "English" world. In their one day at Lucky Land, each girl has a life-changing adventure that will alter the way she thinks about her upbringing - and herself - forever. And when Abigail falls for Shane, a troubled but kind-hearted teen from Florida, she must make the ultimate decision: return to the safety of the Amish world or leave her family behind in favor of a life she's never known and a feeling she never expected. This fast-paced, fun, and joyful new musical employs a contemporary Pop/Rock/Folk score to tell a story that is light in tone but deep in thematic content. Its unique exploration of Amish culture and the intriguing custom of Rumspringa renders it one of-a-kind in the contemporary theatrical canon. And, with a refreshing wit and charm laced throughout the original songs, Single Rider is certainly a thrill ride audiences will not soon forget. Clay Singer (SHANE) is thrilled to be part of this Single Rider company! He earned his BFA in Drama from Carnegie Mellon University. Clay's recent credits include: Romeo and Juliet (Westport Country Playhouse), Firefly in the Light (NYMF) and Ragtime (CMU). Big thanks to Kate and the entire team! Marc Cornes (GARRETT AND OTHERS) is thrilled to be a part of this new work! National Tours: Mamma Mia! Farewell Tour (Bill), Peter and the Starcatcher (Swing). Favorite NY Credits: Ted in Propaganda! The Musical (NYMF 2016), Britt Craig in Parade (Secret Theatre), and John Hinckley in Assassins (5th Floor Theatre). Marc would like to thank everyone at ATB, and Greg for all the love and support. For Mamma and Miller, always. Samantha Disney (LOLLIPOP LADY AND OTHERS) is thrilled to be joining the cast of Single Rider! NYC and regional credits include 54 Below, The People’s Improv Theatre, (PITS, The Unauthorized Holes Musical) Woman in Black (Why are You Nowhere?) Eileen Evergreen (Nice Work if You Can Get It) The Baker’s Wife (Into the Woods) Shelby (Steel Magnolias) Blue/Orange Girl (SHOUT! The Mod Musical) Gwendolyn Pigeon (The Odd Couple) Rusty (Footloose) Meg (Little Women, the Musical) and Ruth (Plain and Fancy). Lots of love and thanks to my family, husband, and fat cat Louis. Ben Salus (LARRY THE LEPRECHAUN AND OTHERS) is thrilled to be making his Off-Broadway debut in Single Rider! Originally from Philadelphia, he earned his BFA from Boston University where he was awarded the Provost Scholarship. He also has a diploma in Classical Acting from the London Academy of Music and Dramatic Art. Regional: Brigadoon, Victor/Victoria, Billy Elliot, Fiddler, among others. He loves developing new work for the stage and also works as a writer and producer. Thanks to the killer team, his friends, and his family for fueling the fire and supporting the journey. If you want to feel great about yourself: @bensalus. Amanda D’Archangelis (MUSIC AND BOOK) is a composer and actress in NYC. She holds a B.F.A. in Musical Theater from The Boston Conservatory. She is a composer in the renowned BMI Lehman Engel Musical Theatre Workshop. With Anderson Cook, she has written two musicals; The Disembodied Hand That Fisted Everyone to Death- The Musical! and Blatantly Blaine- A “Family” Musical. Both were listed as “Best Things To See This Week” by TimeOut New York. She is the resident composer of Bluelaces Theater Company, which provides theater and outreach for people with developmental differences. Her new musical "The Radium Girls: A Jaw-Dropping New Musical" written with Sami Horneff and Lisa Mongillo, was one of the winners of the Players Theatre Short Play and Musical Festival. This past fall, she had an equity reading of Fat Kid Rules The World written with Anderson Cook and Ben Lapidus. Fat Kid is an an adaptation of a young adult novel of the same name, and was originally commissioned by Marc Eardley. Sami Horneff ( LYRICS AND BOOK), a born and raised New Yorker, is a current Lyricist in the world-renowned BMI Lehman Engel Musical Theatre Workshop. A proud graduate of Brown University with a degree in Theatre Arts, Sami has also trained at CAP21, NYU's Steinhardt School, and The London Dramatic Academy. Sami made her New York composing debut with the 2014 musical “Something Precious,” directed by famed acting coach Anthony Abeson. In 2016, she was nominated at the Indie Series Awards in Los Angeles for her songwriting work on the web series "The Under 5ers," which she also helped write, develop, and produce. Sami wrote both music and lyrics for "Rock and a Hard Place," a new cross-genre musical that had its World Premiere Off-Broadway at The Players Theatre in a concert-style reading starring Constantine Maroulis and many other Broadway favorites. Her work has also been performed at the Metropolitan Room and Feinstein’s/54 Below. Sami wrote lyrics for a new song cycle entitled “A Never-Ending Line,” composed by Jaime Lozano, which had its debut at Broadway au Carré in Paris and ran at The Players Theatre Off-Broadway in a fully staged production in August 2017. Her lyrics for the short horror spoof musical “The Radium Girls: A Jaw-Dropping New Musical” propelled the show to win at The Players Theatre Boo! Short Play Festival in October 2017. Upcoming: Book and lyrics for “Single Rider,” a new musical running Off-Broadway in May and June of 2018. Kate Lumpkin (CASTING DIRECTOR) is a New York based Casting Director and the founder of Kate Lumpkin Casting, a firm that champions new works for local, regional, national, and international clientele. Kate is also the Resident Casting Director for the Musical Theatre Factory and Midnight Theatricals in New York, as well as the US/Canadian Casting Associate for Celebrity Cruises. Prior to opening her own firm, Kate worked with the team at FOX East Coast Casting on numerous projects including, The Rocky Horror Picture Show, STAR, Scream Queens, The Orville, 24: Legacy, Prison Break and many others. Recent projects include the Kennedy Center's West Side Story, Off-Broadway's sleeper hit Afterglow, Evocation to Visible Appearance for Humana Fest at The Actors Theatre of Louisville, Diaspora at The Gym at Judson, Counting Sheep at 3 Legged Dog, The Other Side of Paradise at ArsNova, and numerous workshops of new plays and musicals. Collectively, as a casting professional, Kate has worked on over 40 TV/Film productions and 80 theatrical productions across the country. Kate is passionate about education and has been a guest teaching artist for numerous Universities, is a lecturer at many summer performing arts programs, teaches ongoing workshops, and coaches private clients across the United States. 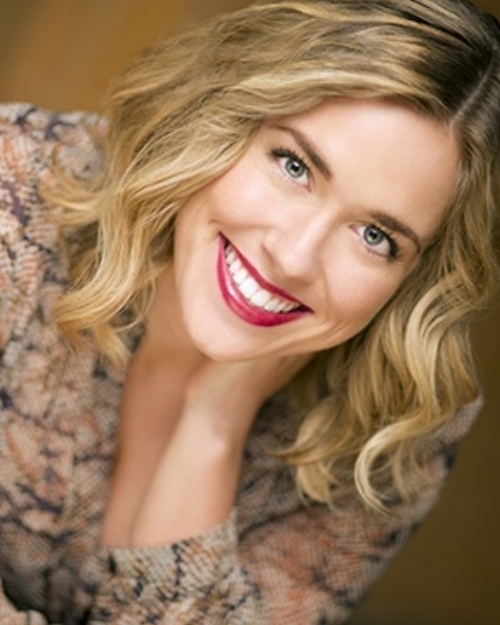 She is also currently a staff member of The Broadway Collective, where she teaches masterclasses in voice, acting, and audition technique in over twenty cites across America and at the "Gathered" summer intensives in NYC. For more information, please visit www.kate-lumpkin.com. Kelly Mackenzie Weaver (PRODUCER) is a New York based producer and young professional. She received her Bachelor of Music in Musical Theatre from Oklahoma City University, but now spends most of her time working in IP and Entertainment Law as an executive assistant and paralegal. In addition to having extensive experience on stage and in the office, Kelly has spent time working in many aspects of the theatre. Kelly is COO of Broadway Unlocked, and producer of their yearly #giveback concert. She has also recently produced the world premier of Honey Dipped Apocalypse Girls, the first New York workshop of Movies, Musicals, and Me, and assisted the production team for Kerrigan & Lowdermilk’s The Bad Years. Allison Benko (DIRECTOR) is a feminist director of plays, musical theatre, and opera. Recent/upcoming projects include Another Mikado (upcoming premiere with the Ridgewood’s Gilbert & Sullivan Opera Company -- also playwright); The End of Mermaids (upcoming premiere through the Corkscrew Theatre Festival); What Happened That Night (upcoming premiere with Project Y’s Women in Theatre Festival); A Doll's House: A New Opera (Central Square Theatre — also developer and co-lyricist); The Secret Death of Puppets (New York Public Library and Standard ToyKraft); Every Christmas Story Ever Told (Gloucester Stage Company); The Arthur Miller Centennial (Gloucester Stage Company — also lead writer); Twelfth Night (Powderhouse Park), and She Loves Me (Tufts University). Notable assistant direction includes Oslo at Lincoln Center Theater directed by Bartlett Sher, which received the Tony, Obie, Lortel, Drama Desk, DCC and OCC Awards for Best Play. She has also studied ritualistic shadow puppetry under senior government fellowship holder Ramachandran Pulavar at the Tholpavakoothu Puppet Centre in Kerala, India. She is a member of the Lincoln Center Directors Lab, and holds a B.A. in Drama from Tufts University. Anthony Brindisi (MUSIC SUPERVISOR/ORCHESTRATIONS) is a pianist, composer and conductor from Long Island, New York. His past credits include A CHRISTMAS STORY: THE MUSICAL (National Tour), FRIENDS: THE MUSICAL (Off-Broadway) where he was the Associate Conductor, as well as PHARMABRO (Off-Broadway) where he played keyboard and assisted in keyboard programming. Anthony is a proud member of the Lehman Engel BMI: Musical Theater Writing Workshop as a composer, and a graduate of Berklee College of Music. Thank you to my incredible family and friends for the support, and special thanks to Jon, I couldn’t have done this without you buddy! Congratulations to Sami and Amanda, two of the most inspiring people I’ve had the pleasure of working with, and here’s to Single Rider and every collaboration that comes after it!